-1 lb fresh Italian sausage – I use Hot Italian (like me). I remove the casings because that stuff tears me up, yo. I used 6 sausages, which came in one package, because I like a lot of meat. 1. In a large pot, bring pasta water to a boil. Cook the pasta. 2. Meanwhile, in a large skillet with olive oil, cook the sausage on medium-high, breaking it up with a wooden spoon, until lightly browned. Transfer the sausage to paper towels. Add the kale to the pot and cook/turn until wilted, about 3 minutes. 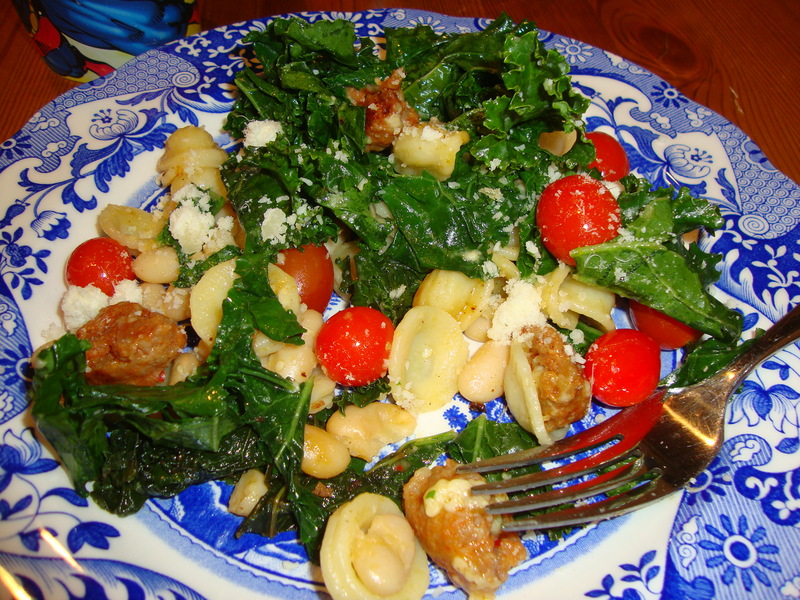 You may need to add the kale in a few batches depending on the size of your skillet. Just move slowly when flipping the kale. Otherwise you will be like the Swedish Chef in the Muppets with flying food all around (me?). Add the beans and tomatoes. 3. Drain the pasta and put pasta back in your large pasta pot. Add the butter and cheese. Mix. Add the sausage. Now add everything from the skillet (kale, parsley, tomatoes, beans). Add lemon zest, lemon juice and parsley. Sprinkle more cheese on if you like while you eat. Serve and enjoy!